Be warned: this is a first impression review; i´ve only had the pdf for two days, and so this is more a general impression than an in-depth analysis. Also, i make no judgement of the rule system or the plentiful setting fiction in the text. But: all in all, i´m very impressed by Dark Harvest. The setting blossoms from a cohesive and fascinating concept- Victor Frankensteins´ discoveries forcefully altering the spirit of the age, creating a Romanian hell/ paradise. This idea allows games that effortlessly move across historical romance to horror, “retro-transhumanism”, swashbuckling superheroism or angsty drama. Its hard to NOT grab a pencil and jot down game ideas while reading. To my utter delight, the book takes its setting seriously. If you want it, you will find a clear and cohesive explanation of balkan politics and society, not just the rules and stats for horrific body modifications.. and you even get an overview with map of every one of 40+ romanian (well Promethean) regions, complete with descriptions. If you GM, this is the stuff that saves you a lot of work. 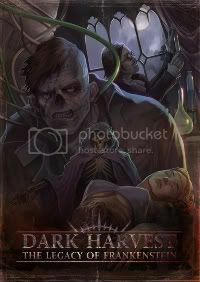 …If you like the fundamental idea of Dark Harvest, the book won´t dissapoint.